Earth Day is celebrated on April 22nd. It’s a day all about the environment, conservation of resources, recycling, and lowering your carbon footprint. And it’s a great way to work science and math into your curriculum. Your kids can feel like heroes when they learn how to go green! Talk about how plants help clean the air we breathe, and how plants need air, water, and sunlight to grow. Have kids keep a journal with drawings to track how the plants change each day. 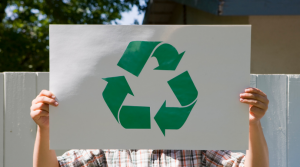 We can recycle a lot of the trash we produce in our homes, like newspaper, glass, metal cans, and plastic. Brainstorm a list of ways you can reduce trash in your home. Ideas could include taking reusable shopping bags to the grocery store, coloring or drawing on both sides of the paper, eating whole fruit instead of pre-sliced or packaged convenience foods. For K-2nd graders, create special recycling bins. Kids can get involved by decorating the bins. Have them draw or cut out and glue-on pictures of what goes in each bin. For 3rd-5th graders, check out the EPA’s Recycle City online game and learning tools. Your carbon footprint is the impact you have on the earth in terms of carbon dioxide emissions, or greenhouse gasses. These are gasses that are emitted when coal, oil, and gas are burned. You can reduce your impact on the earth by making positive choices around the home. This carbon footprint worksheet helps kids understand their impact on the earth. It includes a parent discussion guide as well. What better way to spend Earth Day than with some time outside! Plan a scavenger hunt with the kids. Your scavenger hunt could focus on birds and bugs, keeping a count of how many you see of each. Or a leaf hunt, collecting leaves from the trees you see, and using a guide-book to identify them. You could also have a flower photo safari and take pictures of flowers in your neighborhood. Energy conservation not only reduces pollution, it also saves you money on your electricity bill. Older kids can calculate the amount of kilowatt hours your appliances use. Then they can use your bill to calculate how much each device costs to use. For younger kids, appoint a King or Queen of Energy Conservation. Make them responsible for turning off the lights or unplugging chargers. Earth Day is a great day to enjoy the outdoors. Use it teach about nature, conservation, and recycling. Shannon Bedrich is co-founder of ElectricityPlans.com, an online shopping site for electricity. 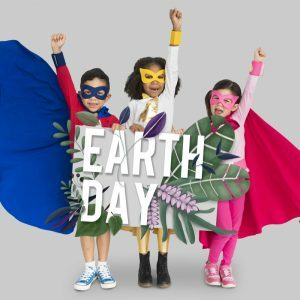 When she’s not wearing a super-hero Earth Day cape, she writes about how to save money on electricity.